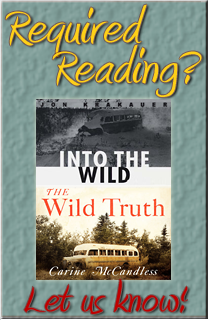 Does The Wild Truth Tell the True Story of Chris McCandless? 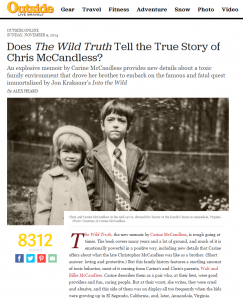 The Wild Truth, the new memoir by Carine McCandless, is rough going at times. The book covers many years and a lot of ground, and much of it is emotionally powerful in a positive way, including new details that Carine offers about what the late Christopher McCandless was like as a brother. (Short answer: loving and protective.) But this family history features a startling amount of toxic behavior, most of it coming from Carine’s and Chris’s parents, Walt and Billie McCandless. Carine describes them as a pair who, at their best, were good providers and fun, caring people. But at their worst, she writes, they were cruel and abusive, and this side of them was on display all too frequently when the kids were growing up in El Segundo, California, and, later, Annandale, Virginia. According to Carine, Walt was a violent bully who drank heavily and sometimes flew into rages that ended with whippings and beatings for his wife and children. Billie was the primary victim, Carine writes, but she was also a victimizer, belittling and betraying both kids at crucial junctures. A vivid example occurred a week after Carine graduated from high school in 1989, when she came home from a date just before a household curfew. Walt, she writes, was… See the complete story on OutsideOnline.com.